It’s always the season of giving back to causes near and dear to our hearts. If you’re looking for the perfect place to spread some love around, we recommend checking out these awesome organizations that we had the pleasure of supporting with our visual note-taking services. Keep reading to learn more about them and see the visual notes that we created to help communicate and spread their missions. The Freshwater Lab is an initiative to communicate Great Lakes water issues to the general public, create tools to visualize the current state and future scenarios of water sources, engage unaffiliated groups in water planning, and train a new generation of Great Lakes leaders. We partnered with the Freshwater Lab to support their Untrouble the Waters Summit, which was dedicated to bringing mayors, local leaders, and researchers together to envision and launch projects that benefit communities and watersheds alike. We captured live talks and created two living walls to display the event’s content to passers-by. Nationwide Children’s believes that no child should be refused necessary care and attention for lack of ability to pay. Upon this fundamental belief, Nationwide Children’s is committed to providing the highest quality patient care, advocacy for children and their families, pediatric research, education, and outstanding service. 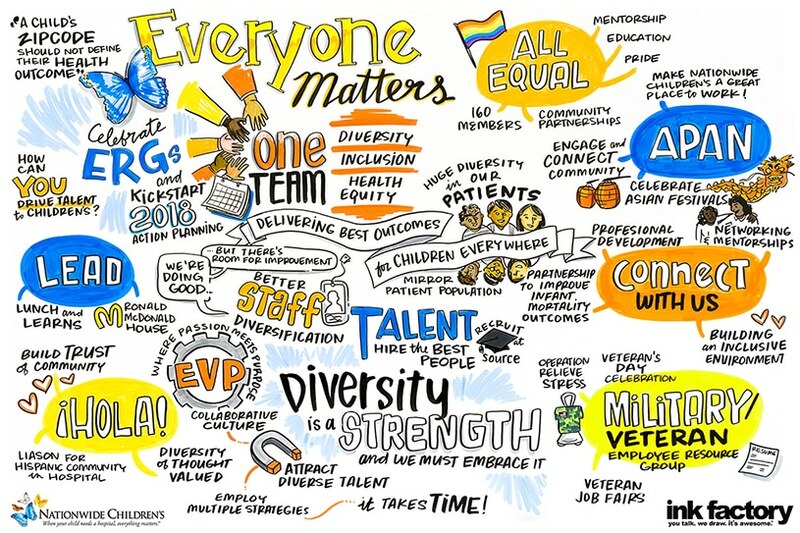 We joined them to record their ERG summit through visual notes, where representatives from all ERG’s came together to engage in efforts to build a diverse and culturally competent work force. The Brain Research Foundation supports neuroscience research that leads to advanced understanding of brain function in children and adults. This Foundation is committed to advance discoveries that will lead to novel treatments and prevention of all neurological diseases. They deliver this commitment through both research grant programs, which provide initial funding for innovative research projects, as well as educational programs for researchers and the general public. We joined them for an evening of fundraising, where we visualized statistics about neuroscience research and ways the foundation is fighting stigmas against neurological diseases and funding vital research. 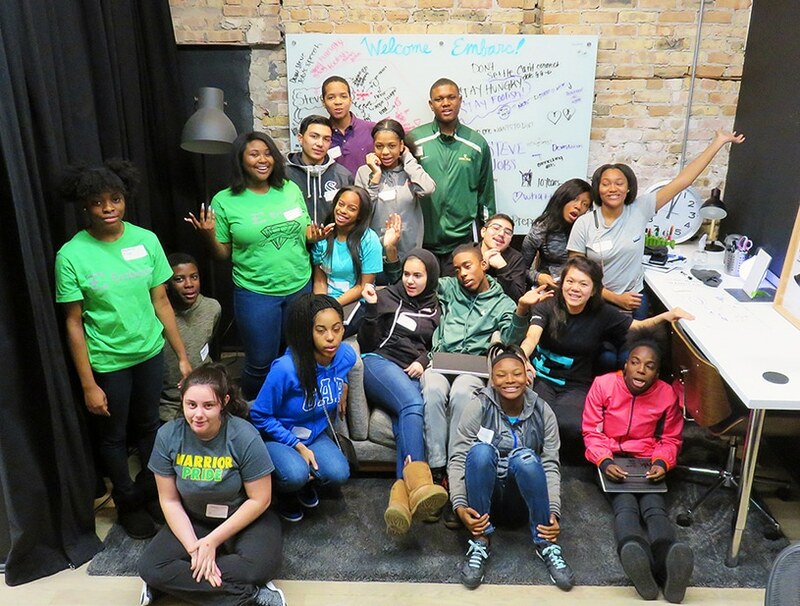 By supplying students with positive models of success and journeying out of their neighborhoods to directly engage with the cultural and commercial worlds in Chicago, Embarc lays out the practical steps necessary for students to move towards their dreams. We hosted Embarc students in our studio to learn the basics of visual note-taking. We’ve got a talented group of future visual note-takers on our hands! 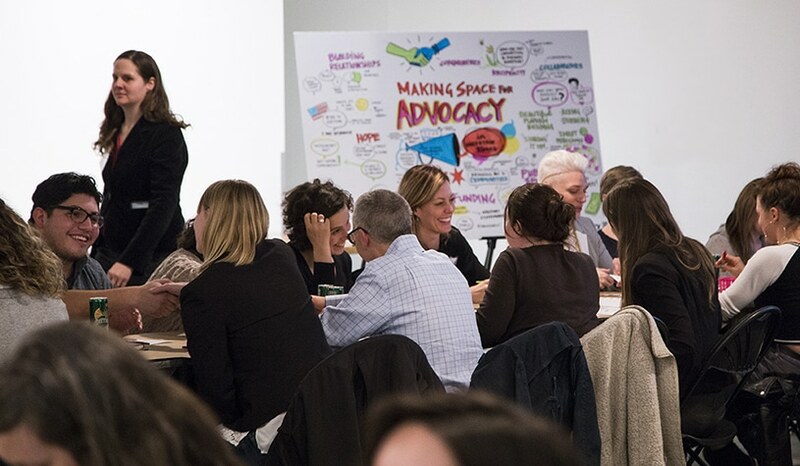 The Chicago Food Policy Action Council facilitates and informs the development of responsible policies that improve access for Chicago residents to culturally appropriate, nutritionally sound and affordable food that is grown using environmentally sustainable practices. 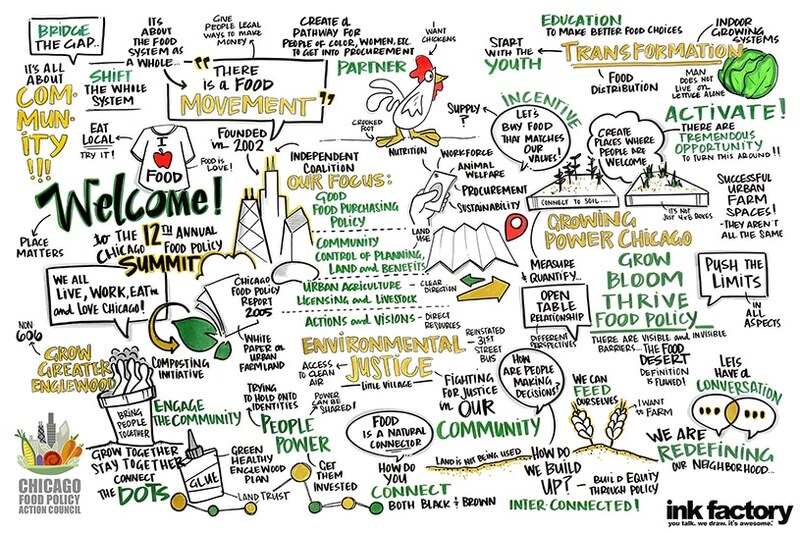 We joined them for their 12th annual summit, where we created visual notes recording conversations around environmental justice, empowering people through food, and creating a healthier community. The Arts Alliance Illinois is a leading voice for the cultural sector and creative industries. Through civic engagement, arts education, and cultural equity initiatives, they promote the value of the arts and give voice to a creative state. We joined them for a member meeting to discuss making space for arts advocacy in the beautiful Mana Contemporary gallery in Chicago. 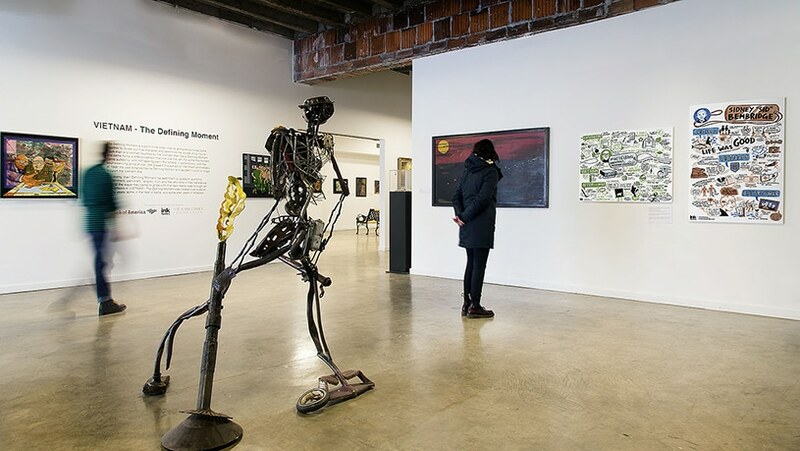 To bridge the gap between the perception and the reality of combat, the National Veterans Art Museum offers a place where all can experience combat inspired art. NVAM provides both a physical and emotional space for veterans and civilians of all ages to come gain a new appreciation for how the split-second decisions made in combat can impact a lifetime. 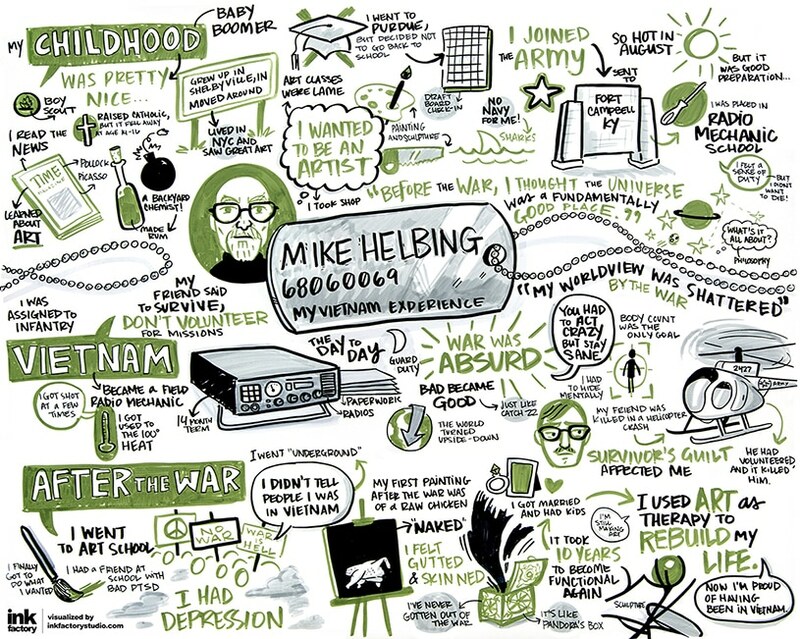 They reached out to us for a more humanized and visual way to tell the stories of Vietnam War Veterans. We interviewed veterans about their lives and how they were impacted by their experiences in the war, and turned them into a visual story. These illustrations will be on display at the museum until the spring of 2018. 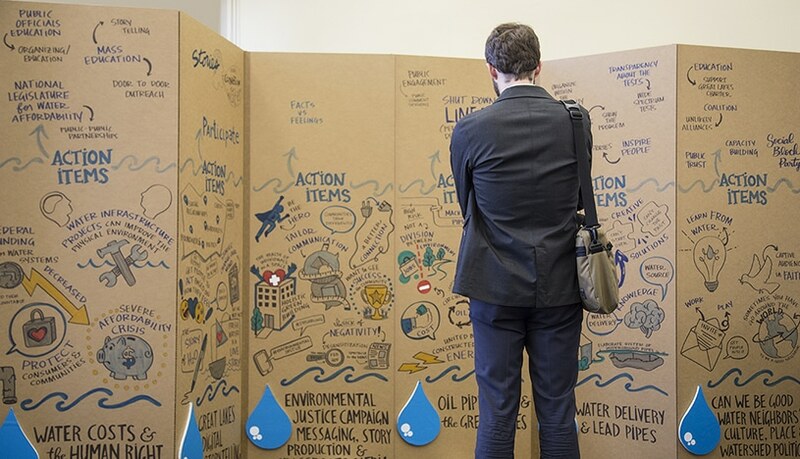 Do you know a non-profit that would benefit from visual note-taking? We want to work with them! 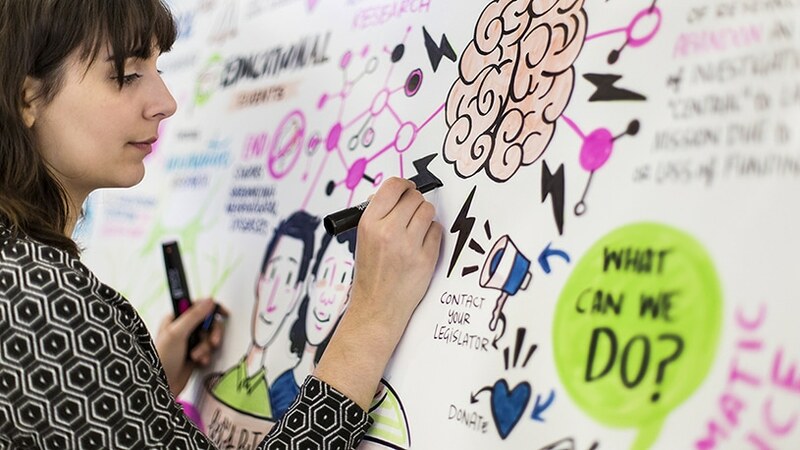 Check out our visual notes to learn more about how we create engaging events for all of our clients.